Our Fall full moon is a time to reflect on our Earth Walk. We’ve journeyed far and wide to get to this point of our lives. Feel into what that looks like for you. Give a prayer of gratitude for everyone who’s touched your life in one way or another, for all you’ve learned, loved, lost, discovered, created, laughed at, cried for, and come through. This time of the season, which marks the end of harvest and beginning of winter, the veils between the worlds are thin. Our dreams are heightened, our intuition is keen, and we have the ability to see the unseen. Take a moment on the full moon to say a prayer to those we love and miss. Light a candle to honor them and all our ancestors and the path they walked. Thank them for their continued guidance and contributing to who you are today, sitting here reading these words. Grandmother Moon’s wisdom teaches the ancient cycles of birth, life, death, and rebirth. She encourages us to birth seeds of intention and plants them in the dark soil of her New Moon, she teaches us to nurture these seedlings to life during her waxing phase, her full moon illuminates what needs to die in order to sustain the life of our intentions, and finally, she helps us refine our intentions through the rebirthing process as we turn inward during her waning phase, thus preparing for the cycle all over again. We see these natural cycles in the macro – global scale, and on the micro – deep within our own psyches. Our ability to successfully navigate the large-scale starts with our ability to successfully navigate the small-scale – ourselves. If we can’t soften the walls around our own heart and show up for ourselves, we’ll never be able to fully soften towards and show up for others. Summon Taurus’s strength this full moon and shine a compassionate light on your sorrows, griefs, regrets, all the should’ve’s, would’ve’s, and could’ve’s, and with deep gratitude honor the lessons they’ve taught you and embody the light and dark within you, the moon does it all the time. Remember, you wouldn’t know the day without the night. It’s all good in every way! In India, this is considered the holiest full moons of the year, one where light dances with darkness. And November is a sacred month with the numbers 11. It represents rebirth into higher consciousness. Taurus composes its powerful music of prosperity, abundance, and love in its earthy grounded way. Between the two, we dance between Father Sky and Mother Earth. Creating our own unique wake in the Cosmic Ocean while sowing our precious seeds and cultivating life on Earth, ultimately creating the art of our lives. 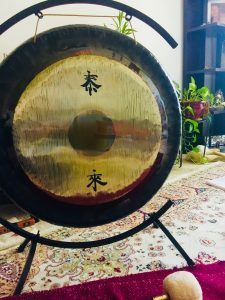 ❤️ 💞 First, I’m proud to introduce my newest vibrational baby, Shakti, my Symphonic Gong. She sings OM, the sweet song of the Universe and her Tai Loi symbols translate to Happiness is Here… I would agree! You can hear and feel her healing song in all my online classes, private sound meditations via skype or in person, and tonight with our band, The Crystal Vibe Tribe. ❤️ 💞 Our Full Moon Sound Meditation with a special Water Blessing is happening Friday 6pm on Juno Beach Access #33. All details are on our Facebook Event Page. ❤️ 💞 I’m leading Sadhana this Saturday 4:30-7am at Kula Yoga Shala. Join in anytime, no experience necessary, only a desire to participate in your life in a more grounded and calmer place. All details are on the Facebook Event Page. ❤️ 💞 Amanda and I have been working hard on fine-tuning our themed Tulum, Mexico Retreat, “Moving Towards Serenity”. You can check out all the details and be sure to sign up for our newsletter to stay in the know on all the fun stuff in the works! ❤️ 💞 My online classes are such a joy to teach. We’re learning tools to find greater clarity, reduce stress, and soften our edges. Hummee Hum Brahm Hum. We are the spirit of creation! Try to chant along and feel the vibration move through your body…. feel it in the heart, throat, cheeks, and lips!